Taking care of our body skin is as important as taking care of our facial skin. It’s important to moisturise our body skin by using body butters, oils, lotions (whichever y'all prefer) and yes, scrubbing twice a week is important too in order to remove dead skin cells. Today, I will be talking about a body sorbet and two body butters that I received from Aroma Essentials a couple of weeks ago. Aroma Essentials is a range of skincare products that may make a useful addition to your daily skin care regimen. These include cleansers, sunscreens, moisturizers, exfoliants, facial cleansers, toners, retinoids, herbal and nutrient supplements, and cosmetics. Jasmine Body Butter: Ah! The smell of this body butter is absolutely…. invigorating but strong and it takes time to dissipate. It is a reminiscence of my childhood, when I used to go to the famous Hazratganj market of my city Lucknow where the street vendors would sell beautiful jasmine gajre. 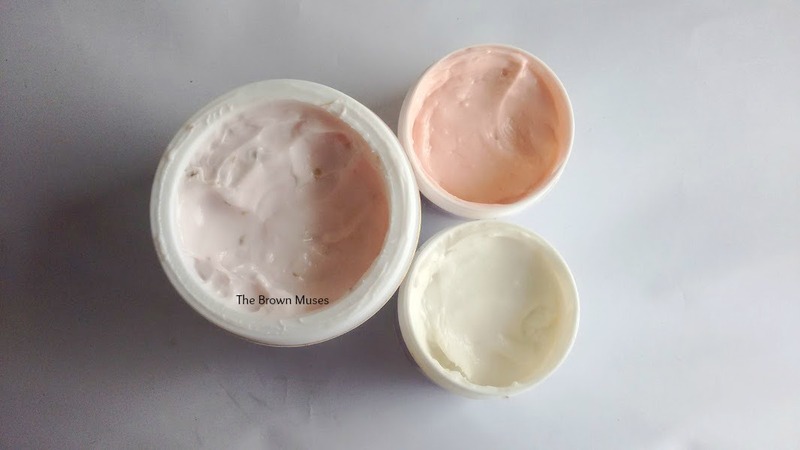 The body butter is white in colour and comes in a travel-friendly plastic jar filled up to the brim. It has a light whipped crème like consistency and a velvety texture. It spreads on to the skin easily and I prefer using it post bath on damp skin as the skin is able to seal in the moisture for longer. A little quantity is sufficient as it absorbs into the skin very easily. The body butter consists of shea butter, cocoa butter, mango butter, soya extracts, and jasmine EO. The body butter keeps my dry body skin moisturized for a good 5-6 hours before the need for reapplication arises as I have to sit in AC for hours due to my job. The butter doesn’t feel heavy post application and leaves no oily residue. Oily skinned beauties can adjust the quantity. The product is priced at INR 350 for 50 grams. Rose Geranium Body Butter: The body butter comes in a white coloured plastic jar filled up to the brim and is light pink in colour. It has a whipped crème like consistency and a velvety texture. 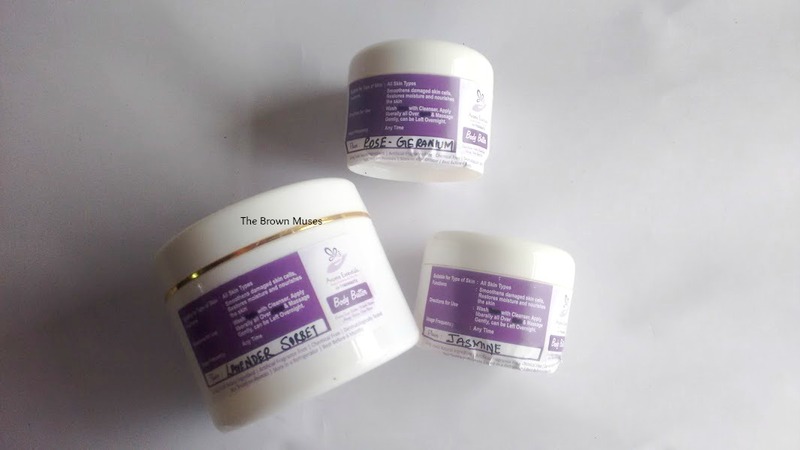 The body butter smells absolutely divine and moisturizes the skin for a good 5-6 hours before the need for reapplication arises, giving it a healthy appearance. What I also love is that the scent lingers on the skin for a couple of hours before fading. The body butter is made using shea butter, cocoa butter, mango butter, soya extracts, ylang ylang and rose geranium EOs. I use this body butter the way I use Mogra Body Butter, and like it’s counterpart, the body butter hydrates the skin nicely without leaving any greasy residue. It’s one indulgent way to pamper your skin! The product is priced at INR 350 for 50 grams. Lavender Body Sorbet: Pale violet in colour, lavender sorbet comes in a plastic jar, which is slightly bulky to travel with. Madhurima has a knack of only producing amazing smelling products and this one is no different. It smells predominantly of lavender and has a mousse like consistency This weightless body butter also has English lavender buds suspended in it. The product is perfect for humid summers to moisturize the skin lightly But if you have dry body skin like mine, this wouldn’t be moisturizing enough and you will need to reapply often or go for their body butters. The product is priced at INR 550 for 100 gm. Availability: You can find Aroma Essentials products on their Facebook page here or you may WhatsApp the brand on +91-7760988272 and the founder Madhurima Ramakrishna shall address your queries therein.